Sapphires and rubies are no newcomers on the bridal jewelry scene but, have become even more popular in the past few decades. The dream sapphire ring worn by (late) Lady Diana with the gem, being worn decades later by Kate Middleton did ignite interest in sapphires. Many style gurus claim that, the change in purchasing trends of engagement rings, pushed the market away (slightly) from diamonds and closer to colored gemstones. Young couples are taking a more responsible stance when, choosing the engagement ring - the carat diamond and 2 months salary media campaigns, are growing a bit dull. If you are looking for an engagement ring, give sapphires a good look and remember that blue is not the only color in which sapphires are found. Yellow, orange, white, green, purple and pink are all colors that can be found in natural colors. 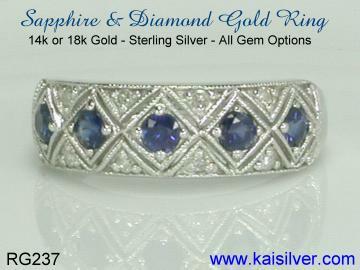 Interestingly many of these colors are priced lower than blue sapphires even, when they have a good color and clarity. So how much should you be spending for your sapphire engagement ring. Honestly this is not something for us to decide, you will be a better person to judge budgets and expenses. However let us make a small case for prudent spending without sacrificing on quality. Think of a sapphire engagement ring that has a modest gem size, big carat sapphires are priced extravagantly and might shoot out of most budgets. If you are attracted to sapphires but, feel that some connection to the diamond convention needs to be maintained, select a gold or 925 silver sapphire engagement ring with a few small diamonds sprinkled into the design concept. Go for a classic design, don't rush for current fashion and trends - these can come and go but, you need to wear your ring for a long time. 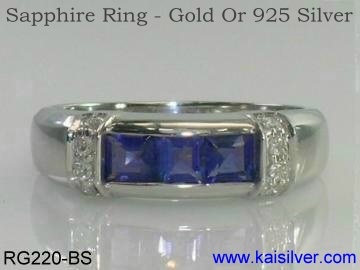 At Kaisilver we would strongly suggest that you choose a good, well crafted and durable engagement ring with sapphire gems. This is because we encourage the practice of passing such important jewels to the next generation. It is really not about saving money in the future but rather, about building family ties and keeping sentiments satisfied. Insist on a natural sapphire gemstones, conventional heating is an accepted treatment. Pay for quality in terms of clarity and color, let size play a secondary role. Open up to white, yellow, green, pink, purple, orange and blue sapphires. 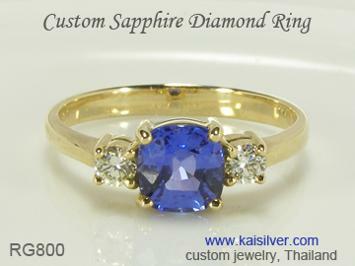 Go for a custom sapphire ring, include your preferences in the design. You can use small diamonds to add glitter and beauty to the ring. If you are not already aware, both silver and gold are now regulars on the bridal scene. Consider passing the sapphire engagement ring from generation to generation. Add beauty to the ring by choosing metal color based on sapphire color selected. 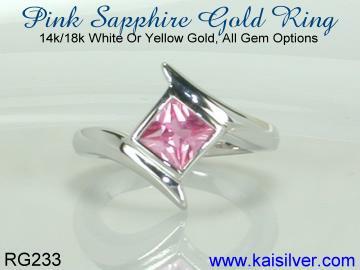 Kaisilver: Widely considered to be the world's most trusted online source for custom jewelry, we craft all types of jewelry in gold or 925 sterling silver. Some of Thailand's finest artisans work on the jewelry that we craft. We do not place any limitation on design and gemstones, you can send in your own design images or sketches to be custom made. You can also pick a design from our website and request for design modifications, all jewelry can be ordered in gold or 925 silver. Our close connection with almost every gem mining center in the world, combined with preferential access to more than 200 million carats of cut and polished gems ensures that, you need not limit your gem selection to what you see on our website. Contact our support experts at sales@kaisilver.com for any questions or requirements that you might have related to gems and jewelry. You need not make any purchase from us to take advantage of our expertise so, do not hesitate to get in touch with us. An elegant sapphire diamond ring, cushion shaped gems are awesome and this sapphire is highlighted by a glittering diamond on either side ... more. Moderate sized square sapphire gems in this engagement ring, ensure a modest price tag, consider mixing sapphire colors ... more. 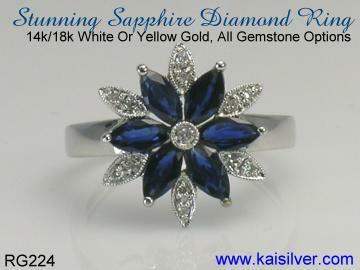 An elegant, sturdy, well crafted and reasonably priced sapphire and diamond engagement. The RG237 delivers quality and elegance ... more. A custom cut square pink sapphire for this stylish engagement ring, you can pick the sapphire color of your choice, no diamonds to distract ... more. Nature's inspiration, a glittering sapphire and diamond flower ring, pick a sapphire engagement ring with a fresh and lively look ... more.